I never forced my kid to eat…a hungry child will eat when hungry…too many treats in between will always ensure a kid that cannot discern hunger! Blend veggies into sauces. They will never know. My eldest loves veg but not the younger one. So the rule was he at least needed to try a veg before saying no. He now eats a lot more veg than he did in the past. We bought a juicer. Encourage them to make their own juices and they love putting in carrots and all sorts of things. If you make it fun, then veggies can be ‘fun’. My 6 years old twins snack on veggies. As long as they see me eat it ,they follow suit … and they drink plenty water as I keep telling them its good for their tummy and kidneys. Cooldrinks and juices once a week on weekend. I do give them treats of course but they listen, I guess I am lucky. I’m not a mom but I was a teacher and there is too much “reward” and value placed on unhealthy treats like chocolate and sweets. It’s the culture of it, and so one needs to counter that way of thinking. Sweets for rewards for doing nothing and all those birthday parties is what messed up my own eating habits as a kid. I put lots of veggies in lasagna meatballs and couscous. My son eats all of them! I grate carrot into mince and they don’t even realize it. My son is so fussy he will only eat it in a stew and only if I feed him. Smoothies, blend into sauces. I did not need to do this, my little one eats most veggies. Serve it often and eat it yourself. Make the plate colourful with colourful veggies. 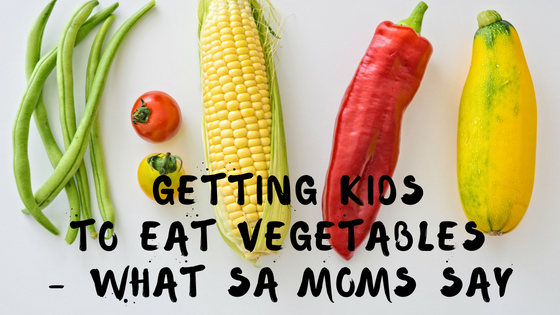 Get them to help you prepare the veggies. Mix them into stew, pasta and bolognaise sauces. Also, don’t turn it into a huge issue – keep offering the veggies regularly and eventually they’ll have them. And don’t overdo the snacks to ensure that they’re hungry at dinner time! Breakfast smoothies work well for us with veg. I juice veg with fruit and my child ends up drinking her carrots (or whatever) if she’s decided that she no longer eats them. Toddlers can eat 5 bananas today and refuse to even touch it the next day. It’s the emotional testing to see how far the parent will go and which boundary applies where. She doesn’t have meal options. She’s never starved herself. She can see the carrots going into the blender with pineapples and oranges and then she chooses to drink it, for example. Add stuff like honey or tomato sauce or yogurt or whatever the child likes and bulk it up with nutrition. They tend to eat a little bit better when they are involved in preparation – even if they can only rinse tomatoes – gets them a little bit excited about the fresh produce. They tend to eat better when we relax a bit. Kids go through times that they don’t want to eat. They will eat when they’re hungry, 100% guaranteed. And they will eat the nutritious stuff when they’re hungry. Unless they manipulate us into feeding them the junk all the time. And then a cycle starts. If one can break it, the healthy food choices can end up coming from the child. As long as we set a balanced example the child will follow. No need to be the perfect example. My child can’t drink wine just because I do and she certainly can’t have takeout every day just because the adult neighbor next door is old enough to make that choice for himself. Works both ways though. If we’re having fried hake for supper and she doesn’t want to eat it because she wants grapes and olives instead – it’s too bad. Not on the menu. She comes back to the fish when she’s hungry. We don’t force her to eat or finish portions. She may leave to play but she always comes back to the same meal. She’s learnt that when she doesn’t like the look of a meal she’s going to have to at least taste it (eventually) before she can declare that she refuses it. She went to bed without supper once or twice in the beginning – nothing physically wrong with her but it’s a natural testing of the boundaries in emotional development. She had forgotten about food completely by the time she had her bath. No fights, no fussing, no forcing. Some kids don’t eat well in winter or when the seasons are changing. Sometimes they’re not sick but can have thick post nasal drip or enlarged tonsils and it makes them appear very fussy with food. Reflux also. They don’t always know how to say it, especially if they’ve been having problems since forever. If there is suspicion of a medical reason then it’s best to consult a medical professional before the Internet. Sometimes you just have to be persistent and keep presenting the same food and eventually they will eat it. Finally Nicky eats broccoli and carrots and I am still presenting the beans. Do you have any great tips you would like to add to the list? Please leave a comment! Next post: Do Expiry Dates Matter?